Last Tuesday at Bible Study our pastor began by asking everyone to move to the front section of the church. He asked again, “Can everyone please move to the front?” He mentioned that he would much rather have everyone to sit together in the front, than to have everyone scattered all over the church. While our pastor said this 3 or 4 times, people still DID NOT move. Finally, he walked to the back where people were sitting and nicely asked again; “Would you please move to the front of the church?” Most people moved after being asked several times. One lady decided to stay in the back and then decided to move later. My thoughts were, why do we have to be asked so many times before we obey? When the man of God ask you to do something simple, will you obey? Husbands, when God gives you instruction for your family, will you obey? Wives, when your husband ask you to do something, will you obey? When your boss ask you to do something, will you obey? When your parents ask you to do something, will yo obey? When God ask you to do something, will you obey?God speaks and moves through our authorities (pastors, parents, teachers/facilitators, your boss, your spouse, your mentor, etc.) so when we don’t obey we are often disobeying God. The only time it is right to disobey, is when what you are being asked to do is contrary to the word of God. God never wants us to do anything that doesn’t line up with the Bible. 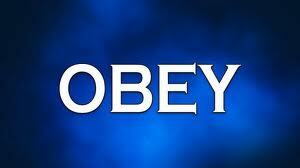 To obey is to comply, follow the commands, wishes and instructions. It also means to submit and to conform in action to some principle. To disobey is to neglect or to refuse to obey. Also, when we delay our obedience, it’s another form of disobedience. God loves when we do what we are asked to do right away! No one should have to keep reminding us! (ouch!) So what is the thing that you know you need to do and you haven’t done it yet? God told you or he used someone to tell you and you have not obeyed. Ask God to forgive you and get moving. Remember that God rewards obedience! In closing I want to leave you with a few verses on obedience.